As well as being good for the environment and improving the schools green footprint composting is a valuable interdisciplinary teaching tool covering areas of the curriculum such art, biology, chemistry, communication. economics, environmental studies, mathematics and sociology. If composting forms part of a waste reduction programme students learn to become wiser consumers that can lead to more responsible and environmentally friendly approach to the use of natural resources, food production and waste reduction and recycling . It also provides knowledge and behaviour changes that can be applied at home. I would like all schools to compost their organic waste but before starting there are some legal requirements. This are not complicated and compliance is simple. The recovery and disposal of waste requires a permit under EU legislation with the principal objective of preventing harm to human health and the environment. This legislation also allows member states to provide for exemptions from the need for a permit, providing the operation is registered with the relevant registration authority. Many schools are unaware that their composting activities come under the waste regulations. 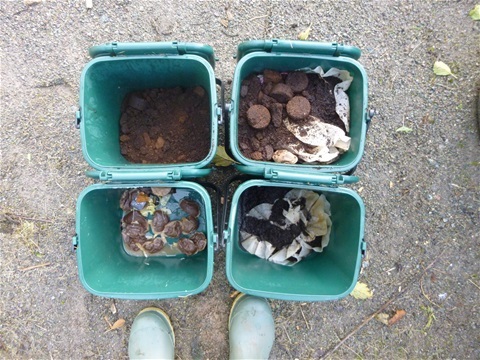 This is the case even when the composting involves the same quantities and techniques as are carried out at home where they do not need to be Registered. In order to comply with government legislation the food waste composted at school must have been created at school i.e. in the gardens, other grounds, packed lunches brought to eat at school and any leftovers from the canteen. 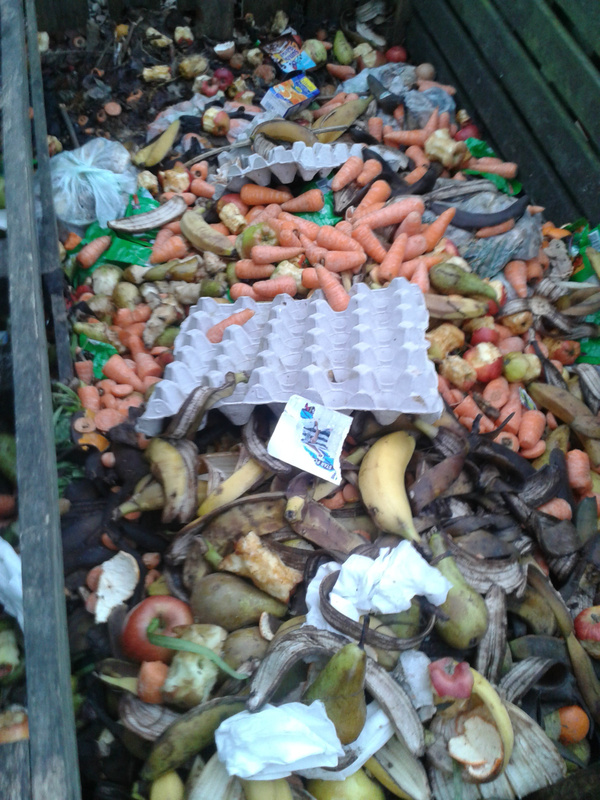 The need for composting at school may be increased as a result of healthy eating initatives where fresh fruit and veg is provided for the children to eat but due to oversupply there is a considerable amount of excess foodSee photo). The material must then be composted on the school site and the compost produced must be used within the school groundsT it must not be given or sold to anyone for use off the site. "The Environmental Permitting (England and Wales) Regulations 2010 were introduced in April 2010 requiring community composters to either register with the Environment Agency for an exemption or for a permit. The majority of such composting groups will be eligible for a T23 exemption (Aerobic composting and associated prior treatment) plus an additional exemption T26 for the small-scale treatment of waste from kitchens using a wormery to produce compost. Only Animal by-products (any material with animal content, including food cooked in animal fat or oil, or dairy products) that come from catering waste are permitted to be composted. Catering waste is leftover food and cooking oil from any kitchen or canteen You don’t need additional approval under the Animal Byproduct Regulations to use your compost on the property where the heap is located (but you must stop farm animals accessing the compost if you put catering waste in your heap). If you want to use your compost at another location, use the following table to find out if you may need approval from the Animal and Plant Health Agency (APHA). As Master Composters, we are often asked for help and advice on composting school garden waste and fruit from student snacks and lunch boxes and Iequipment suitable for this small scale composting is shown on this page. Usually in Leicestershire, we find that this, mainly fruit waste, has been put into a Green Cone, Green Johanna or Dalek composter that has been provided free of charge or at a subsidised price by the Council. As illustrated elsewhere on this website these bins perform effectively in the home garden but one or two bins, designed for a family of four or five, cannot cope with the waste produced by classes of thirty plus children. The Green Cone Food Digesters have either not been used or both the underground chamber and the cone have been filled with fruit and is “not doing anything” (except smelling). The Green Johanna and Dalek bins are frequently full to the brim with an oozing, smelly mess of fruit waste, which is often also seeping out of the bottom of the bin due to the failure to add a bulking agent such as wood pellets, sawdust or woodchips. School compost bins are often contaminated with non-compostable waste, such as sweet wrappers, cling film, plastic bottles and metal cans. In several cases, composting has been stopped due to the bins attracting flies and rats. Often the management of the composting area has been delegated to the Eco Warriors group or Eco Committee, who whilst enthusiastic, do not appreciate the importance of the correct balance of Greens and Browns and the need to add a bulking agent. Carbon-rich material such as shredded paper, shredded cardboard should maintain the Green/Brown balance in the bin and to stop it going wet and smelly but if a lot of food waste is being added sawduct, wood chip or wood pellets may be needed. This is not to say that, with appropriate adult supervision, pupils cannot carry out the routine composting tasks such as collecting and distributing the caddies, feeding the composter, harvesting the compost and using it on the garden. However, a responsible member of staff, whom need not be a member of the teaching staff, should regularly check the condition of the composting bin and lead the pupils in adjusting the ratio of Browns to Greens. Classroom lunch box only or all compostable waste including Canteen Waste ? While the composting of “lunch box” and garden waste are valuable and educational activities, limiting the waste to these two sources omits the major source of school food waste. However, it does mean that the costs of the composting equipment will be significantly lower as “open” compost system can be used e.g. a New Zealand box wooden composter or conventional plastic composting bins. Such compost techniques are given elsewhere on this website, while their application to composting in schools will be considered later in this section. A report by WRAP in 2011, found that the kitchen and canteen areas produced the majority of the food waste in both primary and secondary schools. The report also showed that over 40 weeks, primary schools in England wasted 55,408 tonnes of food and secondary schools 24,974 tonnes. In primary schools the total produced in the kitchen and canteen was 72%, (58% in secondary schools) . WRAP calculated that the amount of food waste generated was the equivalent to 72 grams per pupil per day in primary schools and 42 grams per pupil per day secondary schools. The opportunity should be taken to compost all of the food waste produced by the school in any compost project, including cooked waste from the canteen. In most cases, the food waste is sent to landfill, although the use of anaerobic digestion is increasing. Composting all food has been introduced in many schools with Devon being one of the leading counties. If the school composting project is to include food waste from the canteen, it is essential that the catering and caretaking staff are fully involved in project at an early stage. Composting all food and other organic waste will reduce the school’s environmental impact and should be an integral part of the school waste reduction programme. It also saves money by avoiding the costs of the collection and disposal of food waste by contractors and may well result in a reduction in the number of waste bins hired by the school. Most schools will already recycling some materials such as cardboard, paper and cans and possibly compost some garden and classroom waste. If the composting element is be expanded to become a serious part of the school environmental and waste reduction policy it is essential that all of those may be involved in the operation of the composting scheme are committed to play their role from the start. The first step is to decide whether the composting scheme will be limited to be classrooms, staffroom and playground or whether it will cover all the compostable waste produced by the school including that generated by the canteen and lunch box waste where lunches are eaten in a designated area away from the classroom. If the scheme is to include food waste more compost will be produced and it must be remembered that the compost must be used within the school grounds. It is important to identify those areas were the compost could be used in advance to ensure that the school will be able to utilise the compost produced. My recommendation is that if the school is new to composting it is best to start small just collecting uncooked food waste from the Eco-club or a single class plus trimmings and weeds from the school garden. It is essential that the Head or Principal is involved and supportive from the very beginning of the programme and will act as ambassador to promote the programme. It is important to have the support of the Head before contacting teaching and support staff across the school. With the support of the Head, it should be possible to recruit people for a “compost committee” who will provide the support and enthusiasm necessary for starting and supporting the programme. The committee will need to include staff from across the school community including catering, caretaking staff, administration, teaching staff and the student body. It would also be helpful to produce a simple guide or bullet points outlining the Regulations so that everyone involved in the collection of waste, the actual composting and the use of the finished compost is aware of the legal requirements. It might also be advisable to display notices so that parents are made aware of the limitations imposed on the school. It must be stressed that only food waste created at the school can be composted at school and the finished compost must be used on the school site. This means that while food such as packed lunches can be brought to the school to be eaten and that the waste and leftovers can be composted at the school but ‘food waste’ from home must not brought in from home to be composted at the school. Before commencing composting the school will need to apply for an Exemption under the Environmental regulations. Exemption T23 covers composting of school kitchen and garden waste. T26 is needed if the school is to use a wormery to produce compost from kitchen waste. The compost produced must not be taken off the school site it must not be given or sold to parents or friends as a means of generating income or as a means of dealing with over production of compost from the school waste. A compostable waste audit of the whole school is the usual first step to get an idea of the type and volume of the compostable waste being produced. This normally involves collecting the classroom, staffroom and playground food waste in kitchen caddies or other suitable containers and weighing these to obtain the quantity discarded weekly. Other compostable waste e.g. shredded paper, cardboard and garden waste will need including. It is unlikely that all of the paper and cardboard included in the audit will be able to be added to the compostable waste stream so most of it will still need to be recycled. It is not cost effective to take up space in an expensive food composter with materials that can be recycled but some of the paper and cardboard will be a useful addition to the “garden” waste composter. A Compostable Waste Audit could form part of a wider school waste audit covering all types of waste produced. However, it will be more easily managed if carried out at a different time from the general audit Such an audit involves sorting all the waste for a week into all the different types e.g. paper, cans, food etc and weighing all the different types. It is possible to get a general idea of the waste produced using an audit conducted on a single day and the Eco-Schools Waste Audit for Schools, to be conducted by pupils, is based on a one-day audit. 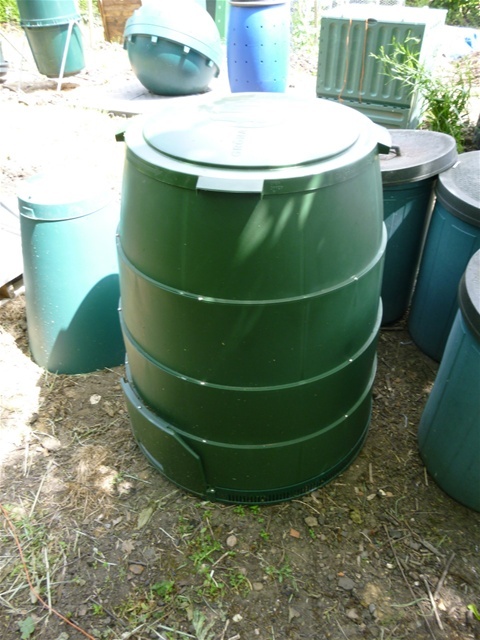 However if the audit is to provide a estimate on which the selection of the appropriate composter is to be purchased an audit over the five day period of a typical term-time week is recommended. The calculation of the total weekly quantity of compostable waste calculated from the waste audit, together with the WRAP estimate of to 72 grams per pupil per day in primary schools and 42 grams per pupil per day secondary schools will enable the selection of a composter(s) of a size appropriate to the waste produced. The knowledge of the sources of the waste will enable the selection of the right size of collection caddies for the classrooms and kitchen/canteen areas. Caddies come in a range of sizes and while the areas producing most waste will need larger caddies or bins in which to collect the food waste in must be remembered that they will need to be moved from the canteen to the composting area and the contents emptied into the composter. Small caddies can be emptied directly into the composter while a larger bin may need emptying in the composting area and the waste transferred into the composter. The size of caddy to be used in the any classroom where students eat will be dependent on the size of the class size and the frequency of collection and emptying. Some schools prefer smaller bins (possibly 5 or 7 litre) which are collected and taken to the composting area daily while other favour larger (23 litre) bins which hold more waste and need collecting less often. Some schools canteens are have adopted the Swedish system of letting primary school children help themselves to food. The theory being that the children take what they will actually eat rather than getting quantities determined by the dinner staff others have adopted cashless systems were pre-ordering is possible.. This not only reduces the food waste produced by the students it also results in less food being cooked in the first place as the kitchen work to reduce the food waste in the area under their direct control. Many items of fruit finding its way into compost bins will only have had one or two bites taken from it and some schools cut up fruit into bite sized pieces making it easier to eat and consequently reducing wastage. Meat, and cooked food should not be composted in conventional compost bins as the most common systems in use do not reach temperatures that will kill potential pathogens and the decomposing food will be likely to attract rats .However with the right composters cooked food waste can be composted quickly and simply. Small Jorra Food composter suitable for lunch box waste from a single class. Free advice on-site can be offered to schools in, and near, the East Midlands on the types of composter available depending on the amount of waste produced. and a member of the local community. It would be beneficial if a composting subcommittee were formed to actually organise and lead the composting project. Student involvement, not just on committees but also in the practical implementation is one of the keys to a successful composting program, and it’s important to encourage them to feel ownership of the all, or defined parts, of the program. While most students will be involved in the program by sorting their lunch box waste daily, discarded other compostable waste into the appropriate bins and possibly separating the waste in the canteen, if a self clear system is used, it helps to recruit a group of ten to twelve students to act as the core committee to drive the programme. These might be the student representative on the Eco-Committee or an additional group dedicated to the hands0on operation of the composting project. As on the Eco-committee there should be representatives for different age groups as this will not only ensure involvement across the school but provide for succession planning so that the expertise can be passed on to the younger students who will eventually become the leaders of the team. If the County has, a Master Composter scheme it would be advantageous if a Master composter was invited to attend the compost committee to act as a source of advice and offer practical assistance. Students should be educated about composting at the start of the school year. The routine for streaming waste can be introduced on the first day of school so that they can sort of lunch and snack waste and start to develop composting habits from day one. A Compost Championing the scheme under which a designated individual being made responsible preparing a rota for distributing, emptying and cleaning caddies, reporting on implementation of the scheme and correct use caddies covering all classes were food is eaten or organic matter is discarded would ensure both wide involvement and the practical implementation of the scheme. The involvement of teaching staff is essential to the success of the project and for ensuring the continued involvement of the student body. Teaching staff play a key role in introducing the program to the students each year, in ensuring that classroom food waste is collected and put in the correct caddies and for integrating composting and waste reduction into school curricula. Course material is available from WRAP, Garden Organic and many other sours A number of sessions are provided on this website. Local Master Composters may deliver presentations for Assemblies and classes as well as specific composting related sessions. The Catering staff (if cooked food or canteen waste is to be included) should be consulted at the outset. It is critical that they be on board with the program, as they will be responsible for several key components. It is also important to consult them on where food waste bins should be located and where food waste should be stored until collection day. The Catering Manager may also need to be involved in modifying the contract with the company that currently collects food waste from the school. On a practical level, catering staff and other lunchtime supervisors will be responsible for waste collection in the kitchen and in the eating area where plate scrapings will need putting in the correct caddy. Those preparing meals will need to segregate waste during food preparation and any leftovers. Ideally catering staff would monitor the quantities of waste produced from their areas. The compost operator’s role should have a separate job description or role profile that could be added to that of the individual undertaking the task. The composting project could provide a useful means to involve parents in the school in addition to a parent serving on the Eco- help as volunteers in the composting area or garden areas during the initial stages of the scheme. Parents who are already experienced composters can use their expertise to help with the composting. A presentation at the PTA meeting could lead to greater involvement and the PTA might help raise funds or seek grants to support the project. An appropriate food composter designed for “commercial” use or a number of garden compost bins if it is decide to only compost classroom and garden waste. 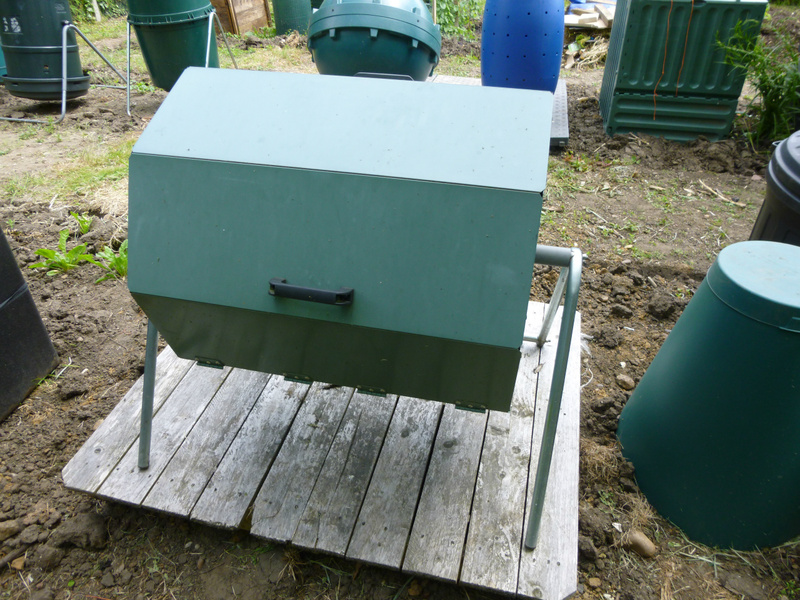 A good quality food composter is not cheap but will prove to be a cost effective investment. A five or seven litre caddy in each classroom where food is eaten, the staffroom and the biology laboratory, should be sufficient if the caddies are emptied daily. If demand is greater, a number of small caddies or one larger 23-litre caddy might be needed. I would recommend two or three twenty-three litre food waste caddies in the dining room and would suggest this type of caddy in the kitchen rather than having a larger wheelie bin. It is preferable to remove the food waste generated by the canteen and kitchens on a daily basis and take to the composting area. When planning to introduce a scheme it should be borne in mind that the purchase of caddies or bins in which to collect the food will have cost implications and that distribution of empty caddies, their collection when full and removal to the composting area within the catering areas will entail additional work for the catering staff. A spatula should be providedfor each of the caddies in the eating areas to scrape leftover food off plates. Tongs are helpful in removing non-compostable contamination from caddies and bins. These can be relatively short plastic tongs to remove glass and plastic from caddies. Longer ones might be required for bins. Food composting systems require the addition of a bulking agent such as woodchip, wood pellets, wood shavings or sawdust and these will need storing in a waterproof container close to the compost area. A plastic bin dustbin would be suitable. A compost scoop is normally used as a means of taking the bulking agent from the storage bin to add to the composter. 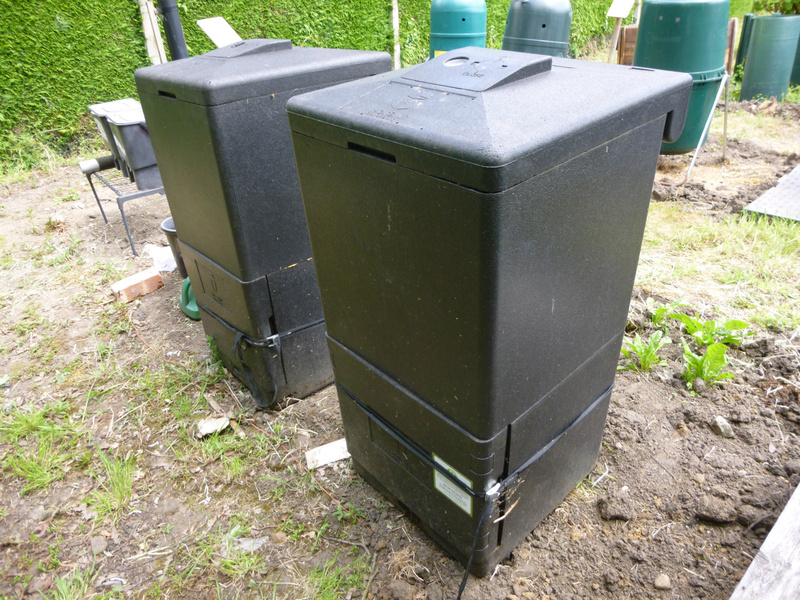 Some people use a compost caddy as a means of transferring the bulking agent and of providing a measure of both agent and food added to the composter. If specialised in-vessel food composters, or other systems for garden compost that produce compost in a few weeks it will need storing to mature. Scotties Hot box provides a purposed designed option or convention Dalek compost bins could be used. A wheelbarrow will be required to move the compost. Some composters can be emptied directly into the wheelbarrow in others the compost will need to be collected in a bucket or similar container. In addition normal gardening tools such as a spade, fork and possibly trowels will be needed. Composting food waste in particular will involve the use of consumables which while relative cheap will be a recurring cost. Woodchip, sawdust or wood pellets depending on the composter used. These “Browns”, carbon-rich materials, will balance the “Green” nitrogen rich fruit and food waste essential for good food composting. It is possible that in many schools one of the parents may have a landscaping or similar business and would be prepared to provide woodchip free of charge. The school would then need facilities to store it to dry. The caddies can be lined with folded newspaper to reduce the amount of cleaning needed, paper alternatively compostable e.g. corn starch caddy liners can be used to help keep for classroom caddies clean. This will added to the costs of the project and I would not recommend their use unless there are no easily accessible facilities to wash unlined bins. The Caddy should have an airtight lid, and should be easy to clean by hand or in a dishwasher i.e. without filters. Handles that lock the lid in place can be an advantage. Conventional rubber gloves should be worn when handing the food waste. Waterproof gardening gloves are recommended for the physical work at the compost bins. While nitrile or latex gloves will be more suitable for some classroom activities. Gel should be available disinfect hands after composing activities where hand washing facilities are not available close to the source of contact. Hand disinfection should be provided to enable unwashed hands to be treated before students touch door handles etc. The waste audit will have introduced the necessity of separating the waste into streams in order to calculate the volumes produced. This concept will need to be developed and introduced across the whole school with all staff and students made aware of the system. The objective is to get everyone to participate in a ‘clean streamed’ waste management system different materials are kept separate can instead of be put in a “mixed” rubbish bin. Most schools with have such a system for recyclable waste such as drinks cans so it should be relatively easy to introduce additional containers for compostable waste. The preparation of posters promoting separation and showing what waste can be composted is a good art and design project. (For details of a Compost Awareness Week poster competition open to schools see www.carryoncomposting.com ) The separation of food waste from that sent to landfill, incinerated or sent for anaerobic digestion reduces the waste collected and taken off site dramatically. It is likely that, with a major publicity drive, posters and an announcement at assembly the initial participation should be good with most food waste diverted to the composting stream. However, there may be a period some weeks after the launch, before putting food waste into the correct bins has become second nature to staff and students that performance may decline. Supervision in the dining area and classrooms will be required to remind people to follow the systems coupled with regular feedback at assemblies and in classes. Even when the scheme has been in operation for some time, there will always be some cans and plastic that finds their way into the compost caddies. One possibility to maintain commitment suggested by a Cornel university report is that the students take it in turns between cafeteria food waste monitoring and some other compost related activity. While the majority of compostable waste produced by a school will be food waste from the kitchen and canteen it might be decided to confine the composting project to waste from the school garden, grounds and fruit and vegetable waste from classrooms and staffrooms. This avoids the need for, the usually more expensive, composting equipment suitable for the composting of meat leftovers and cooked food. In such situations, the school has a choice of using any of the compost bins normally sold for domestic use. Some schools have opted for a halfway house system whereby they collect waste fruit and vegetables from the kitchen preparation area in addition to the fruit and vegetables from classrooms. In addition to fruit and vegetable waste, which provides the nitrogen rich “Greens” for the composting process, which can be collected in Compost Caddies there, will be a need to establish a system to collect carbon rich “Browns”. Whereas the main food waste composting systems usually require the addition of a bulking agent such as woodchip, it should be possible to obtain sufficient paper and cardboard waste to compost “lunchbox” waste without the addition of woodchip. The school office should provide a good source of shredded paper, the kitchen and post room can provide cardboard. The other source of cardboard that does not require addition segregation is to collect it from the cardboard recycling bin. Composting using a number of domestic bins is unlikely to be able to deal with all of the lunchbox and kitchen waste produced by the school. It is important that the composting process is not swamped by waste quantities of fruit waste to the extent that it cannot be balanced by the addition of Browns. This is one of the most common situations I have encountered when investigating composting problems at schools. When many of the food composting systems are being used, it is possible to measure the material being added so as to achieve the correct balance i.e. one caddy of food waste: one caddy of wood chips. In the case of composting using paper and cardboard as the main sources of carbon, this is measuring more difficult and I would recommend that a responsible adult check the bins regularly to ensure the balance of Greens and Browns is right. It is helpful to have a supply of dry woodchip or sawdust available to add to the bin to correct the balance in an emergency. Many primary schools now encourage the children to compost the waste from their snacks and gardens but may encounter difficulties in getting correct balance of "greens" and "brown" (see Compost C: N Ratio ) with the result that the contents of the bin may go black and smelly. 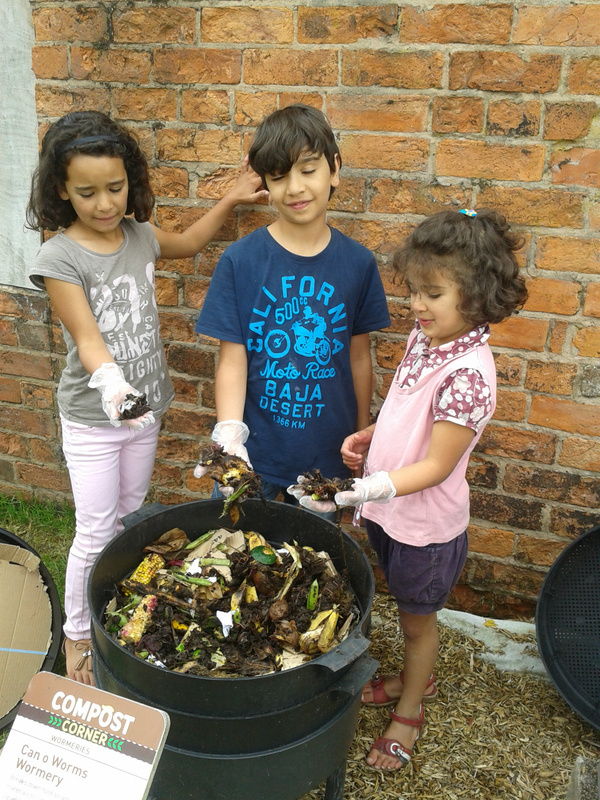 This site provides detailed advice on other pages (see Composting methods) and we can offer on-site advice and practical help can be offered to those starting composting and schools experiencing problems within the Leicestershire/East Midlands area. A wormery can be housed in the classroom or outside in the garden. While a wormery will not replace the school composting system it does provides a means by which students observe the food composting process in detail. Details of wormeries are given on the Wormeries page including indoor wormeries, which can be housed in the classroom or in stacking wormeries suitable for outdoor use. Stacking wormeries, consisting of two or three trays with organic material at different stages of decomposition in my view make the better teaching aid. Composting worms are vegetarians, love eating fruit and vegetable scraps available from the snacks eaten by the students (excluding citrus or onions), and will require shredded paper and cardboard to provide a source of carbon. Although worms can eat more than their own body weight in food per day the conventional “domestic” wormery is designed for the use of a normal size family and will probably not be able to cope with all the fruit and vegetable waste produced by a class. This means that there will still be class fruit and lunch box waste available for composting by other methods. The wormery will require some upkeep, with the worms needing feeding regularly, the trays will need checking for moisture levels, with additional cardboard being added if necessary. If all works well the worms will breed providing an n additional teaching resource. The worms will produce a liquid, worm wee, which can be used as a liquid feed for the garden. The worm compost (castings or worm poo) will need to be harvested from the lower tray occasionally. During the summer months, students on the Eco-Committee can share having the wormery at home, providing them with the opportunity to teaching their parents about worm composting. Set up a working group to discuss type and range of composting to be undertaken. Conduct a compostable waste audit to give an estimation of the volumes involved. Form a Compost committee to deal with day to day management of the scheme Include representatives of teachers, catering staff, technicians, caretaking staff in addition to students.